Learning to use a powerful tool like PYTHA is both exciting and challenging. For some it can even feel a little daunting, so here at Pytha Partners we’ve worked hard to make your transition as pain free as possible. We’ve developed a range of training options to suit all learning styles, and an easy to follow pathway to get you on your way! This is the very best place to start using PYTHA from scratch. We’ve broken the basics in to bite size chunks to get you going quickly. Our ‘Online Essentials Part 1’ course will cover start-up and installation, getting to know the PYTHA interface, manipulating objects and drawing in PYTHA. Online Essentials Part 2 will cover more object manipulation and drawing, specific tasks, methods for staying organised, assigning part properties, dimensioning and labelling. When you’ve completed the above (available from My 3D Shop), you’ll be ready for the face to face workshops below. You can find workbooks and exercises built in with your PYTHA licence. Make the most of these to get going with drawing basic to more complex objects. This option is great for those who like to follow page by page and take notes. Simple step by step instructions and easy to follow pictorials make the exercises easy to complete. You will be amazed at how easy to learn and easy to use PYTHA 3D CAD really is with these great workbook tutorials. We’re building a library of video tutorials that offer easy to follow visual answers to your most often asked questions. You’ll find a bank of videos here, but to make sure you’re the first to see new releases, subscribe to our YouTube channel today. Face to face learning is a great way to experience intensive training. We recommend this style of learning once you have grasped the basics. (In fact, we’ll make sure you’ve completed the online training above before we book in any face to face training). Workshops include New User Manufacturing (Fundamentals), PYTHA 3D CAD for Designers, The Workshop Workshop and V23 Upgrade. 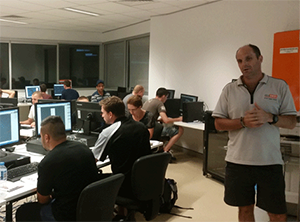 Workshops are held in our purpose-built training rooms in our Sutherland (NSW) office. Schedules will be posted on our Events page soon, but in the meantime feel free to contact us to register your interest. PYTHA is currently delivered as a Certificate of Attainment at three TAFE colleges. Expert lecturers take you through an introductory and follow-on course for one night a week over six weeks. You can learn in a group and get to know other people’s tips, tricks and techniques. Students receive a temporary student licence with which to practice at home for the duration of the course. Register your interest for upcoming courses via the button.